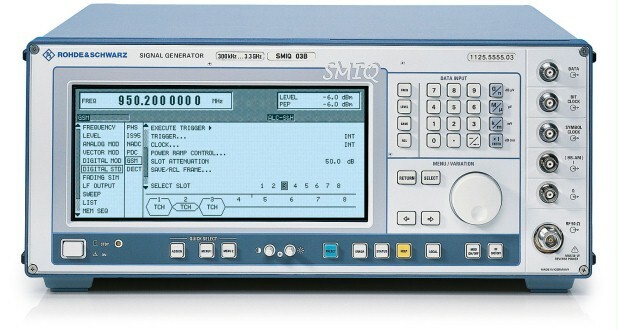 The B series of Signal Generator Family R&S®SMIQ for analog and digital modulation from Rohde & Schwarz offers solutions for today and tomorrow. In particular, this series takes into account future developments in the field of 3rd-generation digital mobile radio. 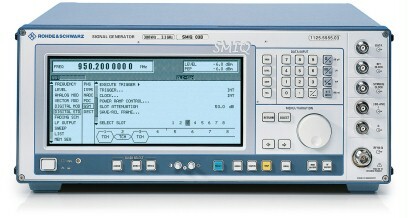 The R&S®SMIQ family comprises four models that differ in their upper frequency limits. These models feature a hitherto unrivalled versatility regarding signal generation and signal quality and are therefore ideal for use in development and type-approval testing. With their outstanding price/performance ratio, these signal generators are also economically attractive for applications in production. The wide frequency range from 300 kHz to 6.4 GHz covers all major radio bands including the IF ranges. The high-grade I/Q modulator fitted as standard ensures minimum error vector magnitude and high intermodulation suppression. Using modern digital signal processor (DSP) technology, the versatile concept allows the generation of high-precision digital modulation signals at high bit rates without any limitations on modulation modes or standards. In addition to digital modulation, the signal generators provide the full range of analog modulation modes as well as simultaneous modulation capability.